Good finishing can be the key to a successful woodworking job, and it's a task that anyone can master. 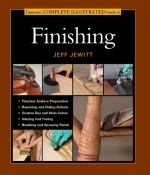 Whether you're just learning or are an accomplished artisan, at The Woodworker's Library you'll find the right book on how to finish your masterpiece in style! Please don't hesitate to contact us if you need any assistance locating the right books for the project you have in mind.